Inadequate Public Hearing involving violations of legal norms: The Public hearing for the project held in last week December 2014 in Panna and Chhattarpur districts in Madhya Pradesh, had seen large number of violations. The EIA was available online only on the day of the second public consultation, documents were in English that villagers couldn’t read, and mandatory advance notices of the meetings weren’t issued to the village administrations. Few people attending the meetings knew what the project entailed. At one meeting, political activists of the ruling party shouted down anyone who raised an issue. Through a letter dated Dec 22, 2014, some of us had written to Mr BB Barman, EAC member secretary and also to the MP Pollution Control Board, listing the violations involved. A PDF file containing that letter and related issues is attached. It is clear from this that the PH held for the project cannot be considered legal or adequate, and MoEF and EAC need to take a clear stand on this. Public hearings in India have remained a box to be ticked marked and there is absolutely no sanctity of basic norms to be followed in the public hearings and the EAC or MOEF has not taken any stand on this. We urge the EAC to urgently reject the public hearings for this project as inadequate and violation of legal norms and ask for fresh public consultation. Inadequate EIA-EMP: Our letter of Dec 22, 2014 highlights a large number of fundamental inadequacies of the EIA-EMP done for the project by the consultant Agricultural Finance Corporation of India. In fact, as a member of the Ministry of Water Resources Expert Committee on Inter Linking of Projects, one of us had reviewed the EIA of this project in 2010, which is also included in the Dec 22, 2014 letter attached, since most of the inadequacies of the EIA found in 2010 continues to remain the inadequacies of the current EIA before the EAC. We urge the EAC to reject this flawed EIA-EMP and ask for a fresh EIA-EMP to be done by a credible independent agency. Inadequate assessment of Impact on Panna Tiger Reserve: The EIA-EMP does not seem to have understood or properly assessed the impact of the project on Panna Tiger Reserve. Given the stipulated FRL and MWL, the submergence area estimation is clearly an underestimate, EIA does not provide the full basis for backwater impact either. It also fails to take into account impact of the project on the buffer zone of the Tiger Reserve. C. EIA also fails to recognise the effect of the reservoir to effectively cut off further areas of the Park to the west, not to mention the areas of Reserve and Protected forests beyond the boundary. These areas will also not be available for the Tigers and other habitat. Examination of their submergence map would indicate that effectively only around 390 sqkm2 of the present 560 sqkm2 park will remain available for the wildlife. Since Scientists have already noted that Panna’s small size is a factor in the long term survival of tigers, to reduce the Park’s area by around 30% would sound the tigers’ death knell. The Forests to the west are established as important dispersal areas for the tigers of Panna. If the dam goes ahead these will no longer be available either as corridor or alternative breeding habitats. The Wildlife Department have records that show that 50% of the breeding tigresses of Panna presently reside in the submergence area and the forests to the west that would be cut off by the proposed reservoir. As many as four male tigers have used this corridor for dispersal. There are no contiguous areas of tiger habitat that can compensate for this loss and the areas being suggested as compensation are far from the Park’s boundaries; thus will be no/little mitigation for the lack of breeding area for the Panna tiger population. EIA mentions that “no operation and activity is proposed in the Park area except the submergence.” Yet the dam is entirely within the National Park and the proposal envisages a population of 6000 or so working for perhaps 12 years to create the headworks & related works– all of whom will be in or on the periphery of the Tiger Reserve and will have massive impacts. EIA also claims that the waterbody will be a tourist attraction and talk of tourist huts and water activities apparently unmindful of the illegality and detrimental effect this would cause on the Park. EIA notes that water bodies can affect animal movement but fails to properly assess or address the effect of the proposed reservoir that, with the downstream Gangau barrage submerged area included, totally bifurcates the core critical tiger habitat of the Panna Tiger Reserve. There is no assessment of the impact of deforestion due to the project on the hydrology of the river. EIA promotes sport fishing, prohibited in protected areas, it seems the EIA agency or the developer has no idea about the law of the land. The EIA actually claims that the reservoir would benefit the park by preventing encroachments, provide drinking water for wild animals, the reservoir will get rid of pollutants by sedimentation and entry of livestock! It shows the abjectly poor understanding of the EIA consultant. 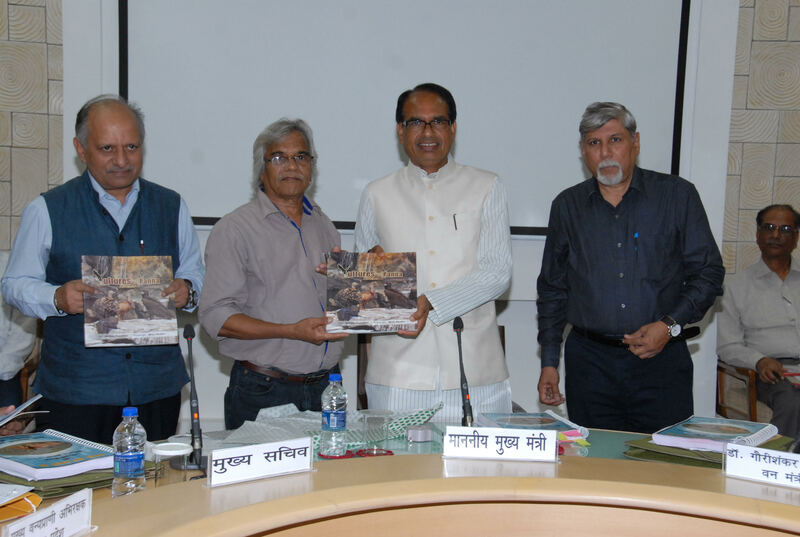 When the project was put up before the Madhya Pradesh state wildlife board (chaired by the Chief Minister) on August 11, 2015, there was strong opposition by the members of the SWLB, and NWDA could not even answer the issues raised by the SWLB members, see: http://www.hindustantimes.com/bhopal/mp-govt-seeks-clearance-from-wildlife-board-to-de-notify-prime-tiger-habitat/article1-1378933.aspx, http://www.hindustantimes.com/bhopal/environmental-concerns-force-deferment-of-decision-on-ken-betwa-river-link-project/article1-1379047.aspx and http://timesofindia.indiatimes.com/city/bhopal/If-Ken-Betwa-link-project-is-so-important-denotify-Panna-tiger-reserve-Wildlife-Board-tells-CM/articleshow/48491167.cms. In fact the EAC and the MoEF allowing pre construction activity inside the Panna Tiger Reserve through the TOR letter of Sept 15, 2014 was wrong since without Supreme Court permission, MoEF or EAC has no mandate to allow such activities inside protected areas. The Greater Gangau Dam reservoir will also make approach of the wildlife to the only perennial water source difficult due to the silt that gets deposited on the periphery of the reservoir. But the EIA has no mention of this. Thus, the EIA has not understood or not bothered to understand the impact of the project on the Panna Tiger reserve. The most fundamental problem with the water balance study is that it does not take into account groundwater potential and use in the relevant basins. Moreover, the water balance also does not look at rainwater as a resource and potential of rainwater harvesting before deciding if there is really any deficit or surplus. That there seems to be no allocation for the environment flow requirements in the river downstream from the proposed dam. While calculating surplus in Ken basin, the assumption is that every Ha irrigated will need 5327 cubic m water. This is very low compared to the requirement assumed at 6157 cubic m per Ha assumed in case of Betwa basin. No reason is given for this huge 16% difference. However, if we look at the fact that whole attempt is to show that Ken is water surplus basin and Betwa is water deficit basin, the rationale behind such assumptions becomes clear. By assuming low water requirement in Ken basin, one can show surplus water availability and by showing higher water requirement in Betwa basin, one can show higher deficit in Betwa basin and thus try to justify a link project that otherwise has no justification. This is further exemplified by the fact that 67.88% of geographical area in Betwa is shown to be cultivable, the figure for Ken basin is much lower at 57.08%. 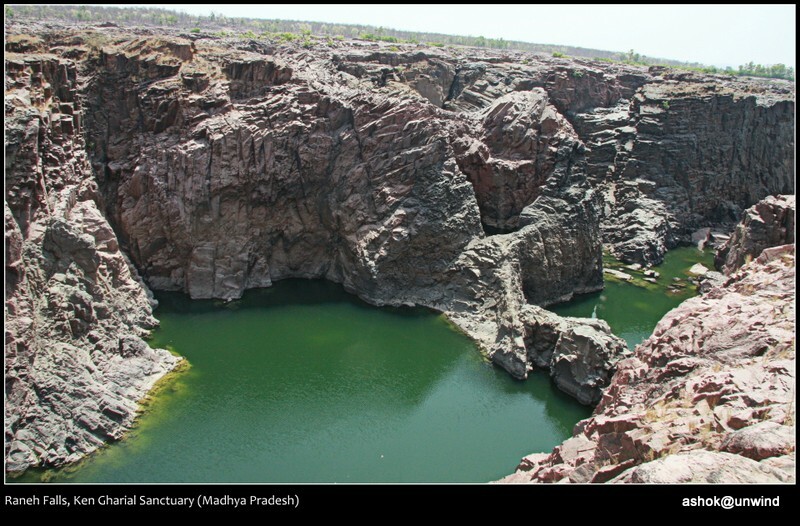 About 85% of the so-called water deficit in the Betwa basin is seen in the Upper Betwa basin, where water from Ken Betwa link cannot be taken. This deficit has been made possible by the assumption that 65.05% of Upper Betwa sub-basin is cultivable and 55.47% of cultivable area here is to be irrigated by 2025. The % cultivable area to be irrigated is highest for Upper Betwa sub basin among all the sub basins in Betwa basin. Contrast these with the figures for Upper Ken Basin: 46.26% of geographical area is cultivable and 42.91% of cultivable area is to be irrigated by 2025. It is assumed that by 2025, 87.45% of cultivable area of Lower Ken sub basin will be irrigated, while only 37.05% of cultivable land in Vearma basin will be irrigated. This clearly shows that the projections are to provide more irrigation to already highly irrigated areas, and starve the unirrigated areas. This difference becomes even more alarming when we consider the fact that over 77% of geographical area in Lower Ken basin is considered cultivable, whereas the figure for Vearma basin is just around 47%. The Study mentions in the Betwa basin water balance that some 3854.5 MCM is to be exported from the Betwa basin. No information is given what is this about, from where and to where and what for this export is. The moot point is that if Betwa basin were not to export this amount of water, it would in fact be a surplus basin. Moreover, if we look at the water allocation and area to be irrigated in KBLP, we find that water allocation is 5189 to 5275 cubic m for every Ha to be irrigated under KBLP. It is a mystery that if the Betwa basin water balance assumes irrigation requirement of 6157 cubic m per Ha of irrigation provided, than why is just about 20% less water allocated for area irrigated by link canals in the same Betwa basin? It is clear that NWDA has refrained from giving correct data and has in fact tended to give biased information, made unjustified assumptions, giving rise to a suspicion that the figures are manipulated to justify an otherwise unjustifiable project. Impact on upstream tribal area of Damoh, Panna and other districts: One of the reaons why Ken is seen to have surplus water is because there has been minimal or non existence water resources development in the the upstream areas of Damoh, Panna, Sagar and others. If there were adequate water resources development in these areas, than Ken basin would not be seen to have any surplus water. It is feared that once Ken Betwa link is built, the upstream areas are destined to remain permanantly backward, and they will not be allowed the develop any water resources development even at local level, under the pertext that such water resources development will render Ken Betwa link unviable. Such fear is strenghted when the feasibility report suggests (p 17) an agreement between UP and MP that MP will not use more water in these areas than what has been allocated for it in the water balance. As the collector of Panna district noted in 2005 itself, if the 19633 sq km catchment of the Ken river upstream of the proposed Daudhan dam (comprising areas of eight districts: Panna, Chhatarpur, Sagar, Damoh, Satna, Narsinghpur, Katni, and Raisen) were to use the local water options optimally, then there will not be any surplus seen in Ken river at the Daudhan dam site and by going ahead with the Ken Betwa Link without exhausting the water use potential of Ken catchment, which is predominantly a tribal area, the government is planning to keep this area permanently backward. We have copies of some of that correspondence and would be happy to provide copies to EAC the same. Impact on Downstream River and Fisheries not assessed: EIA says no change in downstream regime: “no change in the regime of Ken River due to Daudhan dam is anticipated”. Elsewhere it says, “The proposed construction of Daudhan dam and diversion of 1074 m3 water from the river Ken to Betwa would reduce wetted perimeter, river depth in the river Ken below Daudhan dam.” But either way there is no assessment of downstream impacts. Water flow rate changes, water temperature changes, change in amount of sediment, changes in nutrients, oxygen levels, change in biota flow, change in groundwater recharge, etc are all possible effects of dam construction but none have been evaluated or considered in this EIA. The areas of Panna and Chhatarpur districts that lie downstream of the dam are some of the poorest in central India. The effect on the ground water and the river eco system services on which these communities depend has not even been assessed. GEM of the EIA: Project canals will help fish migration and provide a short cut for fish! This is indeed a GEM from the EIA. It says: “Interlinking of these basins through link canal will facilitate rapid migration of the fish easier… The fish has a tendency to migrate upstream. The inter linking of rivers provide another route for fish migration from Yamuna to Betwa and ultimately from Betwa to Ken. Further, the distance from Duadhan dam to the place of confluence of Ken with Yamuna is longer as compared to the distance from the place of confluence of Betwa with Yamuna and Daudhan dam through link canal. Thus, this route will facilitate rapid migration of fish.” This shows shocking ecological illiteracy of the EIA consultants. This para not only shows how poor is their understanding of fish, rivers and ecosystems, it also shows by AFCL should be blacklisted from doing any EIAs. EIA LIES: Endangered and vulnerable species in Ken Basin find no mention in EIA EIA says: None of the species of aquatic plants comes either under rare or endangered or endemic or threatened categories (REET). This is complete lie, since the following paper by KD Joshi and BK Biswas of CIFRI (Central Inland Fisheries Research Institute says that the Ken river has at least 4 endangered and 9 vulnerable species. The EIA is also completely silent about the existence of Ken Ghariyal Sanctuary in the downstream area, which will be destroyed due to the project. CIFRI paper of 2010 said there are 4 endangered and 9 vulnerable fish species in Ken River According to a paper by K. D. Joshi and B. K. Biswas published in J of Inland Fisheries Society of India (42(2): 25-31, 2010) titled Piscine Diversity and Fisheries in the River Ken, proposed for the Inter-River Linking, “53 fish species classified under 40 genera, 19 families and 7 orders. Out of these, 51 species are native and 2 exotic. The river comprises some highly important threatened species including 4 endangered and 9 vulnerable species… The fish species available in the river has immense economic importance”. Endangered species include: Tor tor (Mahseer), Chitala chitala, Eutropiichthys vacha, Ompok pabda. The paper concludes that the proposed Ken Betwa link project will have “Deleterious impacts on piscine diversity and fishery may occur downstream to the Daudhan dam site in the river Ken, as a result of the depletion in breeding and feeding grounds and hiding sites of the fishes. This could be due to reduction in flow as a result of diversion of the water to the Ken-Betwa link.” The EIA has no word on this. Impact of project on Ganga not assessed: The Ken is an important tributary of the Yamuna and thus the Ganges river. Reducing the amount of water & sediment that flows to the Ganges could have deleterious effect on areas well beyond the Ken’s project area. The EIA does not assess these impacts. Alternatives not assessed: There is sufficient evidence (for details, see: https://sandrp.in/riverlinking/knbtwalink.pdf) that suggests that existing infrastructure in the two basins is not used to its optimum levels. There is huge scope for achieving more irrigation, water supply, power and flood management benefits from existing infrastructure. Moreover, there is also big scope for local options in terms of rainwater harvesting, groundwater recharge, groundwater use, watershed management, better cropping pattern and technique and so on. In fact such options would be the best way to increase the employment and growth potential in the two basins. Bundelkhand is known for its rich tradition of local water systems of tanks and others. However, the EIA or the link proposal does not do any credible options assessment. TORs not fulfilled: The EIA does not fulfil a large number of basic requirements, including comprehensive social impact assessment, downstream impact assessment, options assessment, Command area impacts, among others. Command area impacts not assessed adequately: The micro and macro drainage issues related to command area impacts have not been assessed, including need for cross drainage and additional driange requirements. Health impacts of additional water in the command area has also not been assessed, nor has the possibilities of water logging and salinisation properly assessed. Impact of climate change and impact of project on the adaptation capacity of the area and people not considered: We are already facing the impacts of climate change as can be seen from the irregualr monsoon rainfall, increased frequencey of droughts and floods among others. In such a situation, undertaking a major intervention like the KBLP needs to be fully assessed as to how it will perform in changing climate. It also needs to be assessed as to how the project will affect the adaptation capacity of the people and the area in changing climate, since the proejct is going to have major adverse impact in terms of deforestation, damming, drying up of river, destruction of biodiversity among many others. But the EIA does not do any of these assessments. We have been seeing that when we raise these issues, the EIA consultants tend to say that but this was not in the TOR. This should not be considered adequate response on such serious issues. In stead, MoEF and EAC should include these in all TORs and also in the model TOR. EIA contains details of species not found within several hundred kilometres of this area both of flora and fauna e.g. sal trees listed as 3260 in submergence area; sangai, a deer sighted in the project area (only found in Manipur); slow loris from the northeast; slender loris from south India; Philippine pangolin, found only in the Philippines; and brown palm civet, endemic to the wet forests of south India. Fails to mention published information regarding rare fish species in the river. No ecological understanding of the effect of dam on aquatic regime and fish migration. The EIA notes a number of REET (rare, endangered and threatened) species in the area and that the submergence of at least 41 km2 forms a part of their habitat but then say “There are no known breeding grounds for any of the REET within the project area.” If they had really done “extensive survey” as they claim, it should have shown them otherwise. There are vulture nesting sites and tiger breeding areas to name but two of very many more as would be expected within one of the country’s prime protected area. Impact on vulture habitat not assessed: Panna Tiger Reserve, including the area that is going to be submerged by the Daudhan Reservoir is known to be rich habitat for several of the rare and endangered species of the vultures, as it clear from the annual vulture census that has been undertaken for several years. We have seen these surveys and would be happy to share it with EAC. Unfortunately, the EIA agency does not even properly mention this aspect. This shows how poor is their baseline survey. No E-flows assessment: As part of any credible EIA for a major dam project, assessment of environment flow is considered standard requirement. However, the EIA does not do any such assessment and just assumes 6 cumecs (20% of lean season flow) as lean season releases, but there is no assessment of the E-flow requirement for all the seasons and all the various needs and services that the river fulfils. No disaster impact assessment: It is well known that such major interventions like the proposed project has huge impact on disaster potential of the year, and as NIDM and others have recommended, the disaster impact assessment of the area should have been included in the EIA along with how the project will change the disaster potential in the area, but no such assessment has been included. No implementation agreement with Uttar Pradesh It is well known that Ken Betwa link proposal is an interstate proposal between Madhya Pradesh and Uttar Pradesh. An MOU was signed on Aug 25, 2005, almost exactly a decade before the EAC is now considering the EC for the project, signed by UP, MP and MoWR. However, that MOU was only for preparing DPR (Detailed Project Report). The next stage of the process, after finalization of the mutually acceptable DPR is implementation agreement. However, neither a mutually satisfactory DPR has been finalised, nor is the implementation agreement signed a decade after MOU for DPR was signed. There is no point in considering a project for EC when the participating states have not agreed to implementation of the project. Parts of the project are coming for EC in violation of norms It is established norm that full project should come for clearance, but what is now before the EAC is only a part of the full Ken Betwa link proposal. Other parts of the proposal including those in the Upper Betwa basin has not been included in the proposal and EAC should not consider part proposals. No Cumulative Impact Assessment Both Ken and Betwa basins have large number of existing and approved/ under construction projects. Hence as per even MoEF office order of May 28, 2013, before considering EC for any new project, there should be a cumulative impact assessment and carrying capacity study, but this has not been done for either Ken or Betwa basins and hence MoEF or EAC should not consider the project. Absence of credible submergence figures The EIA has hugely reduced the area to be affected in Panna Tiger Reserve and in the surrounding forests compared to the figures given in the Feasibility report of the project, without any explanation. Well known conservation expert Kishore Rithe, in his article in December 2014 issue of Sanctuary Asia Magazine has raised doubts about these figures and has suggested that much larger area will be destroyed by the prject than what is stated in the EIA. He has also said that the EIA does not take into account the biodiversity that will be destroyed in the forest because of the project. Using strong (& justified) words, he has said this is assassination of wildlife, to help the contractors. Biased EIA In the very second paragraph of the EIA Executive summary, it is stated, referring to NWDA studies, “These studies established that Betwa is a water short basin”. But an EIA is not supposed to uncritically accept such assertions or assumption of the developer. In fact the EIA accepts this as gospel truth without critically examining it. Incomplete EIA The EIA does not even have a project layout map, sections like biodiversity impact assessment, hydrological viability assessment, the additional green house gas emissions due to the project, in addition to others mentioned above. EIA makes wrong claims The EIA claims in very second paragraph: “The scope of EIA studies inter-alia does not include water balance studies.” This is a wrong claim since water balance study of the Ken Betwa links establishes the hydrological viability of the project and by not going into the water balance study, the EIA has failed to establish hydrological viability of the project. Incomplete EMP The Environment Management Plan (EMP) in the EIA is incomplete: It does not include environment flow assessment, muck disposal plan, compensatory afforestation plan, Compensatory land allocation for destruction of Panna Tiger Reserve, habitat improvement plan for the balance part of PTR, REET species plan, upstream (of Daudhan Dam) water development impacts/ management plan, downstream impacts management, to mention only a few. Outdated R&R Plan norms R&R (Resettlement and Rehabilitation) plan has been prepared based on norms of National R&R Policy of 2007 and MP R&R policy of 2002, but both are outdated in Aug 2015 where the applicable norms are based on The Right to Fair Compensation and Transparency in Land Acquisition, Rehabilitation and Resettlement Act, 2013. Thus the whole R&R plan is completely outdated and will need fresh assessment starting from Social Impact Assessment. The whole EIA has no mention of settlement of rights under Forest Rights Act. Thus the whole social impact and R&R section is outdated, incomplete and under estimated and hence unacceptable. Fundamental contradictions in R&R figures EIA says that 1585 families will be affected by the Daudhan Reservoir. In next para, this becomes population of 1585! Later, the population affected by the reservoir becomes 7224! Elsewhere the EIA says: “Therefore it is only 806 project affected families and there are no other affected families in the project affected villages.” This not only shows contradictions but absolute callousness of the EIA agency. EIA says minimum agriculture wage is Rs 64/-! The EIA says all the entitlement has been assessed based on agriculture wage rate or Rs 64/- of 2006-07! This is when the minimum agricultural wage rates for unskilled labourers w.e.f. 01.04.2014 is Rs 193, more than three times the rate assumed by EIA agency! Joke of Land for Land by providing 5% of acquired land EIA says that total of 6423 ha of revenue land is acquired and it is proposed to provide land for land to ST and SC families. Than it says for this purpose, a total of 358 ha of land will be required! This comes to 5.57% of acquired land and the EIA consultant says this is sufficient for providing land for land! This is clearly a cruel joke on the ST and SC families and shows how great an impoverishment programme this project is. Social & Environmental impacts of backwater effect not assessed EIA says that 956 ha of land will be affected due to back water impact, but there is no social and environmental impact assessment of the back water impacts. This project is based on false premises and its impact has been inadequately assessed. The Hydrological basis of the project is flawed. No options assessment been done. The EIA is grossly inadequate as described above and fresh EIA is required by a credible agency other than AFCL. EIA does not assess the damage, to a large portion of the population who are presently dependent on the Ken River, Panna Tiger Reserve, not does it value the river or the Panna Tiger Reserve. The project throws the long-term sustainability of Panna Tiger Reserve into severe jeopardy. This in turn will undermine the local tourism industry and all those who depend on this for employment, but there is no assessment of all this. The Public hearings involved many violatons as I have myself witnessed. Under the circumstances, EAC and MoEF should not recommend clearance to the project, reject the flawed EIA and ask for fresh EIA, and reprimand NWDA for the violations in the PH. Dr Bharat Jhunjhunwala (bharatjj@gmail.com), Formerly Prof, IIM Bangalore, Uttarakhand. Tarun Nair (tarunnair1982@gmail.com), http://www.rwcindia.org/alumni-profiles/batch-08-10/tarun-nair/, Member: Crocodile Specialist Group, International Union for Conservation of Nature – Species Survival Commission (IUCN – SSC). Hazardous to all biosphere till proved otherwise. Linking rivers in India is the necessity of time. I read your article on Ken-Betwa river linkage.As a layman I could learn from this article is that, that your main concern about this project is submergence of Panna Tiger reserve. 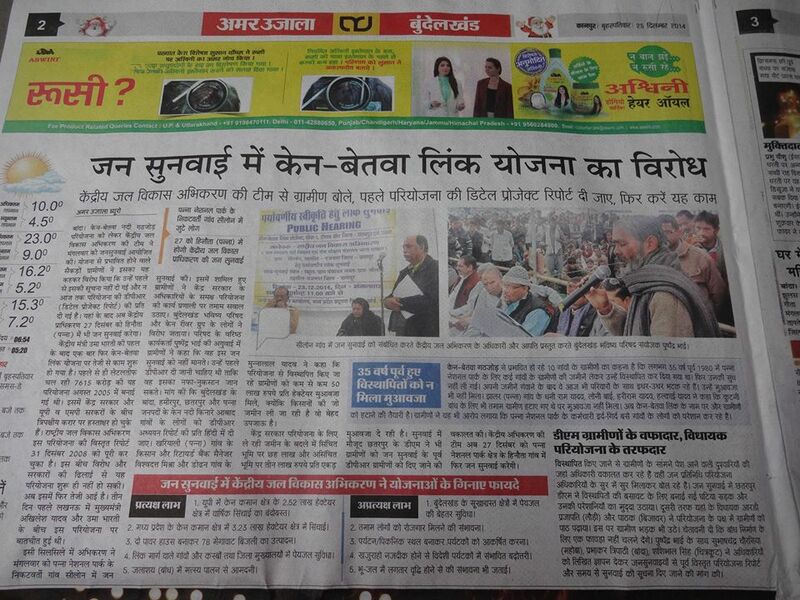 You have not out-rightly rejected the utility of this project.Why don’t you submit you rectification suggestions? Every proposal of a future project is associated with objections, but these objections must be supported with counter-proposals. What is your institution’s basic take on much talked about interlinking of rivers per se ? In all cases, we want an informed, reasoned, democratic decision. That is the basic objective. This project should not be cleared by considering the impacts on Panna Tiger Reserve and its tiger and its habitat along with other wild animals and this proposed project must be scrapped out.It is very sad that area like Panna Tiger reserve comes under such threat.I am fully against of sun interlinking project.